I AM NOT SUPERWOMAN! : Frigo® Cheese Heads®--America's Favorite! We love cheese, well, me the most, and since I am the *cook* cheese happens to end up in many (most) of my recipes. I especially love Frigo® Cheese Heads®string cheese for my own "quick and easy while on the run healthier" snack. Throw a few into my purse as I am frantically running out the door, no fuss, no mess. Peel the wrapper back. Eat. Easy peasy. Fits perfectly into our crazy life style. And the kids love them too! They especially love the Swirl variety. Mozzarella AND Cheddar. What is not to love, right? And 100 calories or less for many of the different varieties. 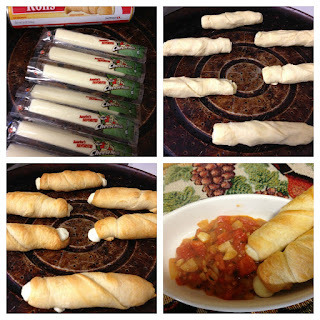 Frigo® String Cheese also fits perfectly into several recipes. Check out their pinterest page for some awesome ideas. I recently made some Mozzarella sticks and dipped them into some homemade dipping sauce made from tomatoes fresh from our garden. Delish! I also make a mean String Cheese Pasta. Yummy! Check out the Frigo® website for more product details, recipe ideas and promotions. Full disclosure: Saputo brands provided me with Frigo® String Cheese products mentioned above for free. All opinions are 100% mine.